Even in facilities with the most rigid servicing and maintenance schedules, there will come a time when rubber lined equipment requires repairing. Often, equipment lined with rubber sheeting is subject to the harshest types of process – think pressure vessels, storage tanks, heavy duty hoppers and chutes, and impellers. Knowing when to replace the rubber sheeting in your process equipment will minimise operational downtime and maximise efficiency, as well as ensure safety at work for your staff. The method of repair will differ depending on these factors – often, larger applications are more difficult to access, and are referred to as “field repairs”. In this case, you’d need to hire a qualified team of maintenance mechanics to access your facility and replace the rubber sheeting on-site. Repairing rubber sheeting is both a complex and precise process. To ensure longevity of your machinery, damages to rubber sheeting should be repaired using the same type and grade of rubber sheeting as the original installation. Where it isn’t possible to re-cure the lining using the original method, your qualified maintenance engineer will need to suggest an alternate method of repair. What types of rubber sheeting repairs are there? To ensure you get the most cost effective repair, talk to your designated Aquaseal maintenance engineer. 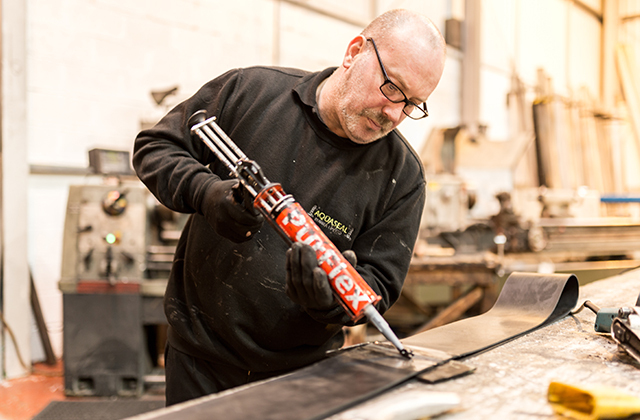 They’ll be able to recommend whether your repairs should be carried out on-site, or if you’ll have the opportunity to remove the particular piece of equipment and have it repaired off-site – this is especially recommended if your machinery requires type C rubber sheeting replacement. What is the rubber sheeting repairs process? First of all, the damaged machinery in question must be prepared for repairs. This will involve buffing and grinding any exposed or damaged metal and/or rubber until it is sufficiently smooth, and any rubber surfaces adjacent to the repair area should be buffed back for a minimum of 4 inches. Depending on the location of the repairs, it will be the responsibility of either your staff or the repairs engineer to dry and clean the damaged area prior to repairing/replacement. This is especially important in environments where the damaged metal and rubber sheeting has come into contact with moisture, and caustic or acidic substances. The area (and areas adjacent to it) must be dry, clean, and sectioned off from attached machinery. Cements will be applied in the correct order, and only to the right material – this will either be prepared metal, or buffed rubber. Surfaces which come into contact with adhesive are known as ‘mating’ surfaces, and usually feature a skive of around 30°. The rubber sheeting surfaces will be rolled down and finished with an stitching seal – this will provide an airtight finish, protecting your machinery from damage for years to come. Which standards will an Aquaseal engineer adhere to during the repairs process? These standards mean that some field jobs may be undertaken in a slightly different order to that which is described above. However, the eventual functionality and service of your machinery will be at the forefront of an Aquaseal repair engineer’s mind, which is why we’ll only fit your machinery with the highest quality rubber sheeting.